Until May 19, 1891, Rock Island did not have a paid fire department but rather relied on volunteer companies for fire protection. Considering that many homes and business still used stoves for heating and gas or kerosene for lighting, it is a wonder that fires were not more frequent and more devastating. When the City Council unanimously approved a new paid – professional – fire department, it consisted of a fire chief, who was paid $800 per year, and six firemen, three per company, who were paid $600 per year. New Chief Ramskill got the department off to a running start. By June, he reported that a new “cart” or hose wagon was ordered, the hook and ladder truck was being overhauled, and horses would be purchased as soon as possible. The Argus argued for an immediate increase in the number of firefighters. It noted that the nationwide standard was four men per company, because one man was needed solely to look after the horses and drive the fire truck and was not available to fight fires except in an emergency. Only three months after the department was authorized, a new fire station was under construction on Flatiron Square, the triangular block where 16th and 17th Streets converge south of Fifth Avenue. 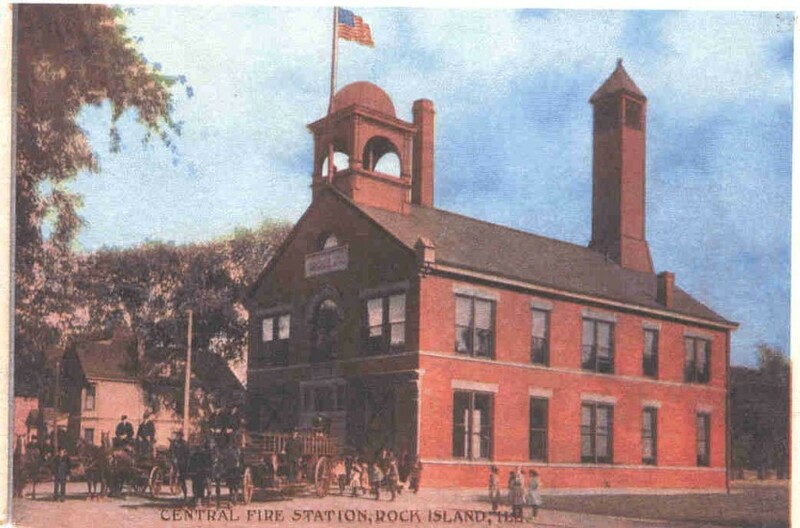 Our postcard shows that new 2-½ story Central Fire Station as viewed from its northwest corner. The rectangular building with its carefully laid-out interior was oriented parallel to 17th Street. The ground floor housed the new dark blue hose wagon that carried 1500 feet of hose on the east side and the hook and ladder truck was parked on the west. Behind the vehicles were five horse stalls. Using what must have been very modern technology for the time, the large front doors as well as those on the horse stalls were designed to open automatically using electricity. This electricity may have been provided by same batteries that were used for the alarm system. A second floor room was dedicated to battery storage. A smaller centered front door led to a vestibule, with an oak staircase to the second story. The firemen’s “sleeping apartment” was to the right while the left side held a reading room as well as the chief’s office and sleeping apartment. The rear of that floor held a harness, feed, and store room, as well as a bathroom, “a province of which the chief feels particularly proud.” The Argus noted that “This is a convenience which the laddies will appreciate.” The firemen undoubtedly did appreciate that convenience, but perhaps did not care to be called laddies. Towards the rear was also a steel (not brass) pole for the firemen’s fast descent when the alarm rang. A year after the fire department was instituted, the last volunteer company had disbanded and Chief Ramskill was planning two new stations for the east and west parts of town. The chief also directed his men to inspect factories, warehouses and other large buildings so they would be familiar with their interiors in case a fire broke out. Sanborn Fire Insurance Maps, which were first published in Rock Island in 1886, also provided information about building structures and uses that would have been useful to firefighters as well as insurers. Our postcard shows a red brick building trimmed with stone. In front was an open belfry with a metal dome-shaped roof. At the rear, a taller 70-foot tower was used to dry the wet fire hose. The hoses were made of natural materials and would rot if stored wet. Every time they were used, they had to be looped in the tower until the circulating air would dry them. The fire department continued to grow and serve our increasing population. By 1912, there were three fire stations with “first class equipment.” The vehicles, which had all been converted to rubber tires within the past decade, were described as “no better drawn by horses anywhere.” A new fire alarm system with 54 boxes had been installed recently along with 150 new hydrants, making a total of 400 hydrants. When an alarm was pulled, the police and water pumping stations were automatically notified to ensure there would be security and enough water to fight the fire. Firefighting changed over the years. Horses were replaced by gasoline engines and small fire trucks got ever larger. Fire stations such as Central that were designed for horses became functionally obsolete. When Rock Island built a huge new Central Fire Station a few blocks west in the late 1960s, the old Central was not unneeded. However its prime location on busy streets made the property, if not the building, very desirable. The old firehouse was quickly razed and a new drive-in bank was built on the site. It was designed by architect Edward Angerer and shows the “brutalist” architectural styling popular in the era. The bell from the old fire station was given to the Boy Scout camp at Loud Thunder. In 2011, it was returned to Rock Island and now is displayedin a structure built by firemen just outside the “new” Central fire station. It still chimes on special occasions. The speed of newer fire trucks also meant fewer stations were needed to cover larger areas. As a result, other vintage fire stations have been eliminated in the past 30 years. Yet those have fared better than old Central, thanks to a concept called “adaptive reuse.” While their appearances haven’t changed much, their functions have. Two old stations — No. 3 at 3101 7th Avenue and No. 6 at 4120 12th Street — have been adapted for private residences. The No. 2 station at 319 8th Street was first remodeled as a wood shop and office and now serves as a home. Station No. 5, at 901-18th Avenue on the corner of the Douglas Park ball field, is owned by the Parks Department and is used as a storage and maintenance building. Here, the use is not all that different from the original, but without the brave firemen upstairs. This article by Diane Oestreich is slightly modified from the original, which appeared in the Rock Island Argus and Moline Dispatch on May 18, 2003.